When you click this button (or press Alt+WB after opening two windows), Excel automatically tiles them horizontally (as though you had selected the Horizontal option in the Arrange Windows dialog box). 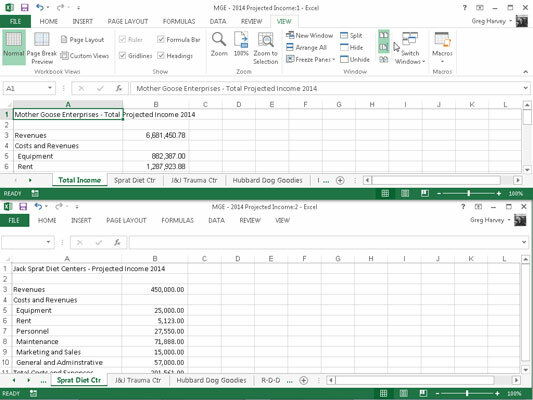 If you have more than two windows open at the time you click the View Side by Side command button (Alt+WB), Excel opens the Compare Side by Side dialog box where you click the name of the window that you want to compare with the one that’s active at the time you choose the command. As soon as you click OK in the Compare Side by Side dialog box, Excel horizontally tiles the active window above the one you just selected.